The Sugar Detox Diet is created by nutritionist Brooke Alpert and dermatologist Dr. Patricia Farris. Together they have designed a plan to help you kick the sugar-habit for improved wellbeing and a more youthful appearance. The average American consumes around 150 pounds of sugar a year and this has a dramatic effect on health. Diabetes is not the only condition that is caused by an excessive consumption of sugar. The Sugar Detox includes a 31-day plan to control your blood sugar, boost energy, release excess weight and improve your skin. The program starts with a three-day detox plan to get the sugar out of your system. You will stop consuming sugar cold turkey because this is the best way to break free of your dependence. During these three days you must strictly avoid all forms of sugar including fruit. You may experience fatigue, headaches, and cravings as you detox off sugar. These symptoms usually resolve as you continue the program. These treatments contain natural ingredients and have therapeutic benefits to improve your skin health and beauty. Once you have completed the 3-Day Sugar Fix you will continue for another 28 days with a more flexible approach. Each week of the four-week plan is slightly different with more options gradually being added to your menu. Week 1: Adds a serving of dairy each day and a glass of wine three times a week. Week 2: Fruit is reintroduced to your diet and you can have an extra serving of dairy. Week 3: You can have whole grains and dark chocolate. Week 4: Allows for more starches and fruit. Vegetables are the number one feature in the Sugar Detox meal plan. You are allowed to eat an unlimited amount of veggies as long as they are on the approved list. Vegetables are beneficial because they have virtually no impact on your blood sugar levels and rich in vitamins, minerals, antioxidants and fiber. Healthy fats are also highlighted because they benefit blood sugar control and prevent cardiovascular disease. Foods containing healthy fats include nuts, seeds, avocado, olives and coconut. The eating plan also includes lean proteins, legumes, whole grains and fresh fruit (in moderation). Lean red meat, pork, chicken, turkey, seafood, eggs, tofu, Greek yogurt, peanut butter, almonds, lentils, quinoa, whole-grain pasta, asparagus, spinach, celery, kale, sea vegetables, avocado, lemon, lime, apples, berries, cantaloupe, coconut oil, olive oil, butter, balsamic vinegar, green tea, herb tea. You are encouraged to use exercise to replace the energy-boost that you used to get from sugar. During the 3-day sugar detox it is best to avoid strenuous activity and stick with walking or yoga. After that you will do a combination of cardio, resistance training and stretching exercises. 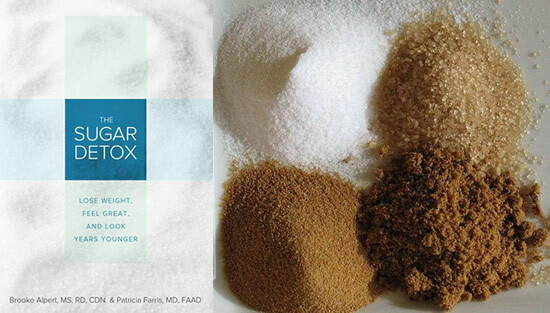 The Sugar Detox: Lose Weight, Feel Great, and Look Years Younger retails at $24.99. Helps you overcome sugar addiction and cravings. The Sugar Detox Diet was created by a clinical nutritionist. Includes a 31-day meal plan with recipes. Can be adapted for vegetarians and vegans. Offers guidance for maintaining the benefits after the 31-day plan is completed. Provides an exercise program for beginners to advanced exercisers. Includes unique advice and protocols for skin care. Does not provide detailed information about the negative effects of sugar. The first three days are very restrictive and require complete elimination of sugar, fruit, wheat, starch, dairy, and alcohol. You may experience fatigue, headaches, and cravings in the beginning as you detox off sugar. May not be appropriate for those who engage in extreme exercise programs such as long-distance running, cycling, or intense cardiovascular workouts. The Sugar Detox is a plan to help you overcome sugar addictions and commence a path toward a healthier lifestyle. The first stages of the program may be challenging as elimination of sugar can cause withdrawal symptoms. However, these usually resolve quickly making way for improved clarity, a greater sense of wellbeing and better health.